While it sounds exciting, planning the trip of a lifetime can be a stressful task in top of planning a wedding. We tossed around ideas of exotic locations, touring the Amalfi Coast or sailing Santorini, but when it came down to it our love for relaxing in the warm Caribbean sun made for an easy decision. Not quick to raise his hand for wedding related tasks, Brian volunteered to lead the search for the perfect Caribbean honeymoon spot. We knew wanted something off the beaten path but also all-inclusive. After writing checks the last six months, the last thing we wanted to was pull out our wallets daily. Unfortunately, outside of the usual spots like Cancun, Jamaica, and the Dominican, the concept of “all-inclusive” isn’t all to wide spread. Nevertheless, the Eastern Caribbean island of Antigua has always been on our radar. Boasting 365 white sandy beaches (one for each day!) and offering some of the most beautiful resorts in the world, it quickly moved to the top of the list. The only problem was that outside of your typical Sandals resort, Antigua wasn't home to many all inclusive resorts that fit our vibe. That was until we stumbled upon Cocobay Resort! We were immediately drawn to Cocobay through their beautifully curated Instagram account. Without hesitation we reached out and booked a 10 day trip in one of their Premium Waterfront Suites. We were lucky enough to be able to leave for our honeymoon two days after our wedding. After a quick stop in NYC we were off on a quick four hour direct flight to Antigua. Upon arrival, the online images of Cocobay’s immediately came to life. With its colorful collection of pastel cottages, white sandy beaches, and turquoise water we immediately fell in love with our surroundings. Upon entering our Premium Waterfront Suite we were instantly relaxed by its spacious interior and one of the best oceanfront views either of us have ever seen. 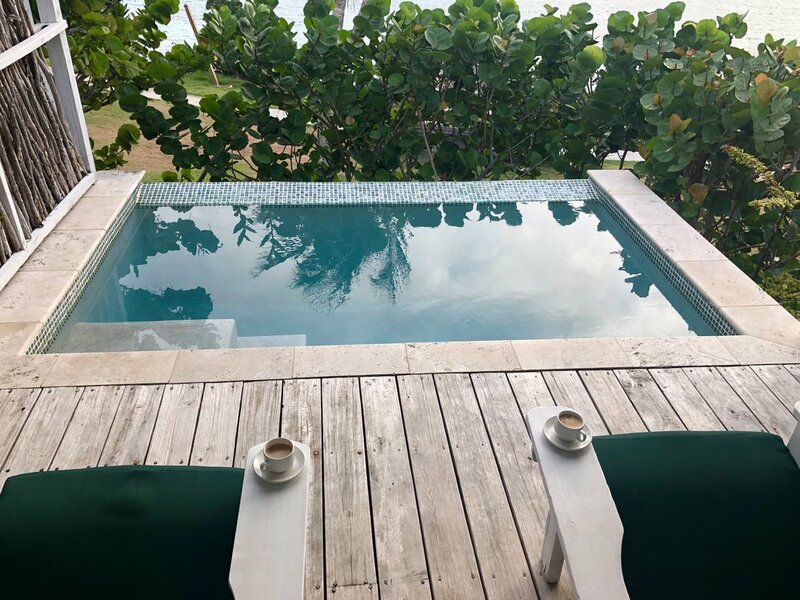 The view was complemented by the cottage private balcony fully equipped with a hammock, daybed, and our very own private plunge pool. Being able to enjoy coffee and cocktails in this private and intimate setting was a highlight of our trip! Cocobay offered two main swimming pools along with a main bar/clubhouse and food was served at their restaurant, Rafters. Being veterans of the all inclusive life we were a bit skeptical of only having one restaurant to eat breakfast, lunch, and dinner, however Cocobay exceeded our expectations. We looked forward to the dinner menu daily and frequently indulged in menu items such as beef tenderloin and spiny lobster. There were also plenty of food options off the resort that were easily accessible via hotel arranged transportation. 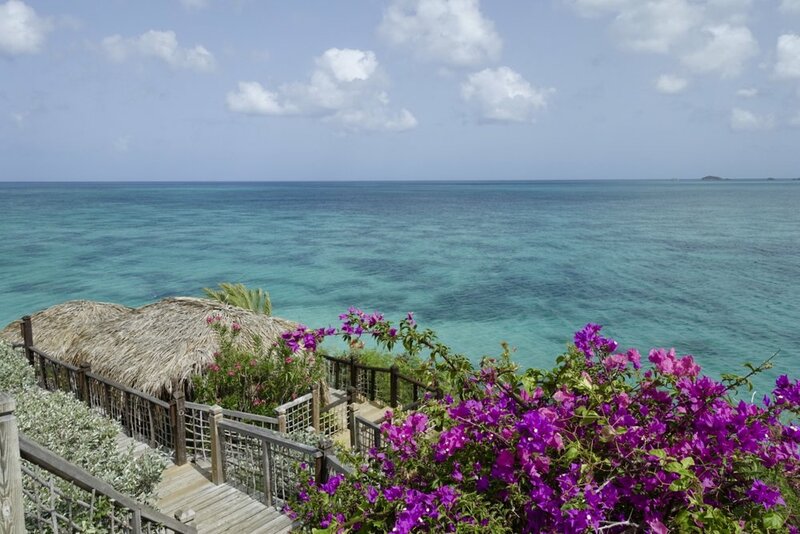 Luckily for Cocobay guests, the grounds also is home to Sheer Rocks, voted the #1 restaurant in the Caribbean in 2018. We frequently visited Sheer Rocks for cocktails and one night for dinner for a culinary experience we will sure never forget. Where Cocobay really won us over though was through their warm and welcoming staff. From the moment we arrived and we were personally greeted by hotel manager O’Neil Richards, we felt the staff’s personal dedication to making sure our trip was a trip of a lifetime, and they certainly succeeded! While we are sad that the wedding journey has come to an end, we are happy we can look back on not only the wedding, but also our honeymoon with no regrets. Thanks to Cocobay we were able to unwind and recharge -together- in one of the most picturesque settings on earth. If you are looking to do the same I recommend checking them out. We surely hope to return one day! Questions about planning a honeymoon, anniversary trip, or couples getaway? Leave them below!